DAVIS, W.Va. — The National Youth Science Foundation in a partnership with The Harless Center, recently hosted a STEM (Science, Technology, Engineering, Mathematics) Teachers Workshop at The National Youth Science Center in Davis. Harless Center Executive DirectorDr. Stan Maynard celebrate the teachers workshop in Davis, W.Va. Photo courtesy of Richard H. West III, NYSF Development Officer. 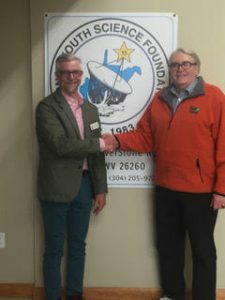 “The National Youth Science Foundation was pleased to host a STEM workshop for teachers and administrators from across West Virginia at its National Youth Science Center near Davis, West Virginia,” said Dr. Andrew Blackwood, NYSF executive director. Nearly 60 teachers and administrators from around the state attended this day-long workshop where they participated in STEM activities such as Environmental Science stream studies, programming of Micro Controllers and Make Do building. Educators and presenters from around the country provided instruction for the day. “Both non-profit organizations plan to continue to offer these programs to West Virginia teachers and students, Blackwood added. Top STEAM students to attend National Youth Science Camp in W.Va.